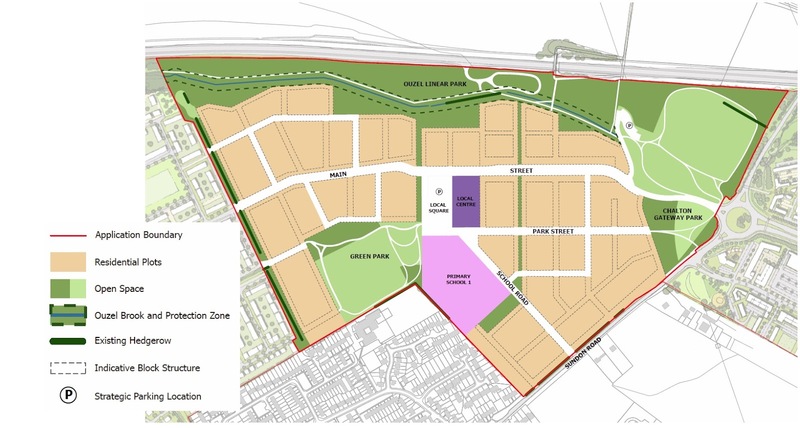 Planning associates for the Houghton Regis North Number One Scheme (HRN1) have submitted additional documents in line with requirements of the outline planning permission for the scheme which will deliver up to 5,150 new homes and other infrastructure. 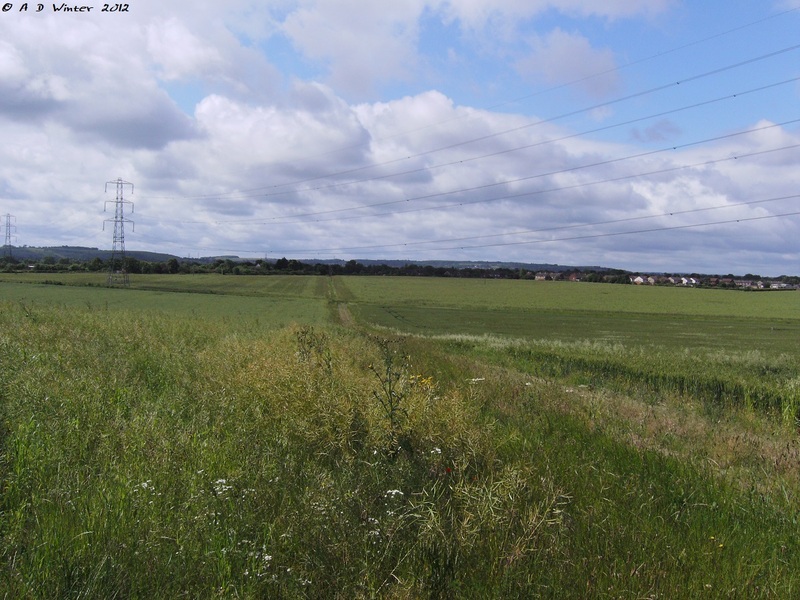 It is proposed to develop an area northeast of Tithe Farm first and this area is known in the overall scheme as Area Master Plan 1 (AMP1). 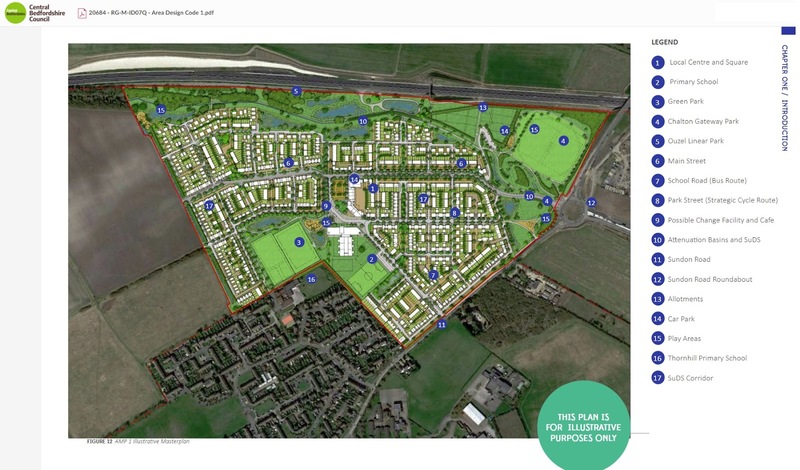 A 166 page Area Design Code has been prepared by the HRN1 Project Team on behalf of Houghton Regis Development Consortium - dated September 2018 (link). This sets out clear guidance to designers and developers and provides a strategic design framework for the Local Planning Authority. It consolidates the principles established by the Outline Application Approval from a design and placemaking perspective. It's a guide to what might be built, not will be built. 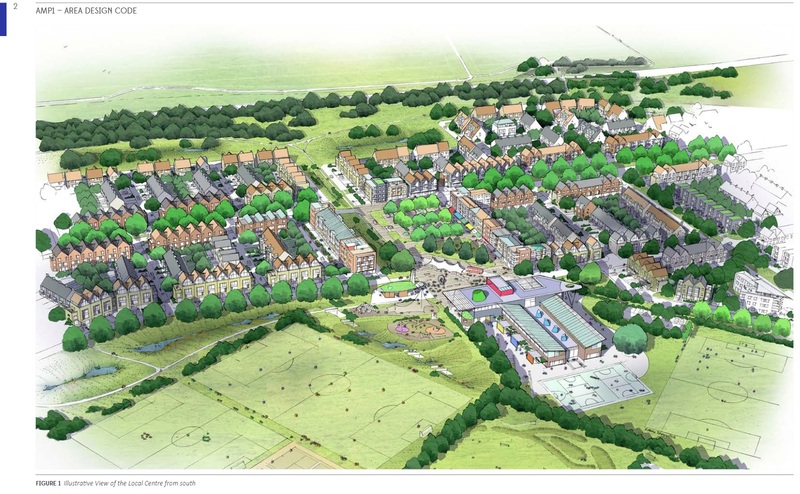 Illustrative images give an indication of what the finished homes and road layouts may look like. Many of the illustrations below are from the AMP1 Design Code. 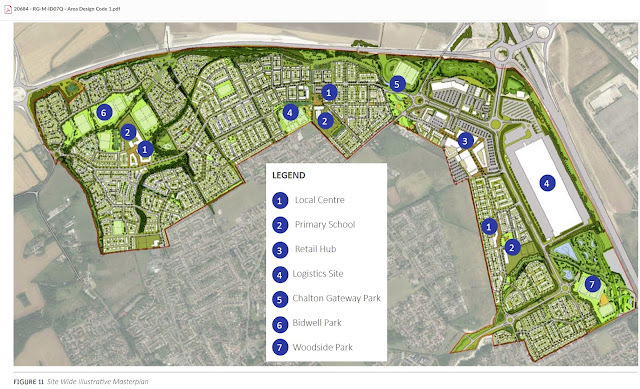 All of the development in the AMP1 area will be bounded by Sundon Road and the new A5 dual carriageway covering a total area of 46.11 hectares (113.94 acres). The 2013 HRN1 scheme put forward by the Houghton Regis Development Consortium, comprised 5,150 homes and 216,200 sqm of buildings supporting employment, retail, leisure and community facilities including a care home. The new development will create 2,500 jobs within the new retail and industrial provision and a further 2,500 jobs during construction. Features for AMP1 include in the northeast corner, 'Chalton Gateway Park'. This will be a highly stylised, miniature chalkland landscaped area together with sports pitches, a fitness trail, play areas and allotment gardens. An overhead power line currently running through fields would continue to be overhead with no building allowed either side of it. A new primary school, a local centre, a green sports park potentially including a pitch with an all-weather surface, a community building and an informal amphitheatre are also included. The primary route would run east-west from the Sundon Road roundabout. This would also take buses, which would serve a new local centre, incorporating retail, community hall, a local square and potentially a healthcare facility along with a children's centre. Bus services will be subsidised through S106 Agreement to serve the new area. Parking for the Local Centre is proposed to be off-street in a car park shared by all users. A strategic cycle route would run through the area east-west. A bus road is expected to go past the new school, but cars and other vehicles would have to take a more circuitous route, discouraging rat-running. The Ouzel Brook and its associated footpaths would be protected, and become a Linear Park. Seating, signage and surfacing will help the Park to "become well used as a leisure route and for its play opportunities, and as a pleasant naturalistic landscape worthy of visiting in its own right" says the Design Guide. Streets would be largely laid out in blocks, many with restricted access, with narrower streets designed for slower speeds to improve safety. The predominant block typology envisaged is‘ back garden to back garden’. 1 bedroom flats to 4 bedroom homes are anticipated. Along Sundon Road and Chalton Gateway Park Frontage heights may go up to 6 storeys at gateways and corners. Drainage fingers would run south to north. Strategic cycle routes would run through the site. Custom and self-build housing have not been left out. An area to the north-west of AMP1 has been set aside for this. On the western edge of the development, the existing hedgerow will be retained to form part of a green corridor through the whole of HRN1. The Design Guide includes palettes for things such as street furniture, planting. Further enquiries and information about this scheme can be found at the official website at http://www.hrn1.co.uk. All of the scheme planning documents can be found on the Central Bedfordshire website as application CB/12/03613. • The AMP1 Statement of Community Involvement (SCI).